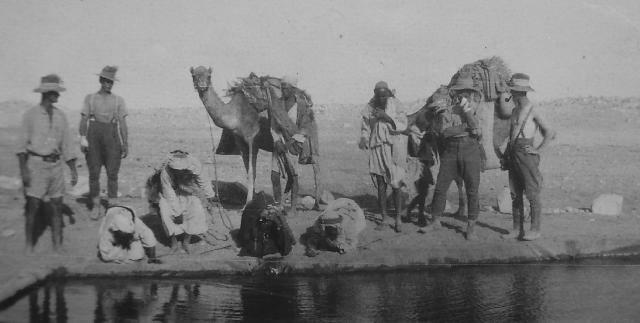 In preparation for the October 1917 breakout of the Sinai Peninsular, various water sources needed to be developed in direct response to the numbers of men and horses that needed to pass this point for deployment at Beersheba. Bedouin watering their camels after the Light Horse have just passed through this well at Khalasa. Khalasa, laying south west of Beersheba and connected to Beersheba by road, was a deserted area with only a well. In previous times it was a fortress serving many masters. Ruins indicate centuries of occupation as a sentinel against invasions from the south and west. With the coming of the Allied forces, the well began to provide much needed water to the local residents, the long term consequence of the war. So while the effort expended was only to provide the Allies with a few days of water, it altered the social fabric and economy of the Bedouin for decades.